AND the nearby Spam Museum (not the email kind of spam, but the possibly edible in-a-can kind) in Austin, MN. Can’t miss that! For this blog, though, I’ll focus on the MAPS fossil show itself. At this year’s event, there were two significant things that are particularly relevant to the Dry Dredgers. Dr. Carlton Brett (UC) was the keynote speaker this year. He presented a fantastic high-energy seminar on Silurian echinoderms. The seminar was tremendously informative, captivatingly interesting, and witty. Afterward, some attendees said, “Best seminar ever!” And it was. A hearty THANK YOU to Carl for an incredible presentation! 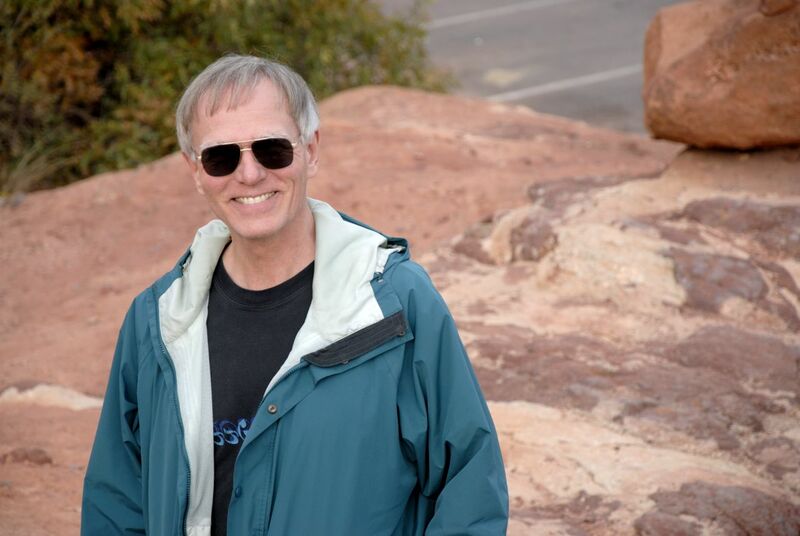 Dan Cooper received the MAPS Don Good Award for his contributions to the organization and to paleontology in general (see Figure 1). Examples of his contributions include organization of the MAPS show, collaboration and publication with professionals, re-discovering classic collecting sites, and donating thousands of specimens to professionals, museums, clubs, and individuals. 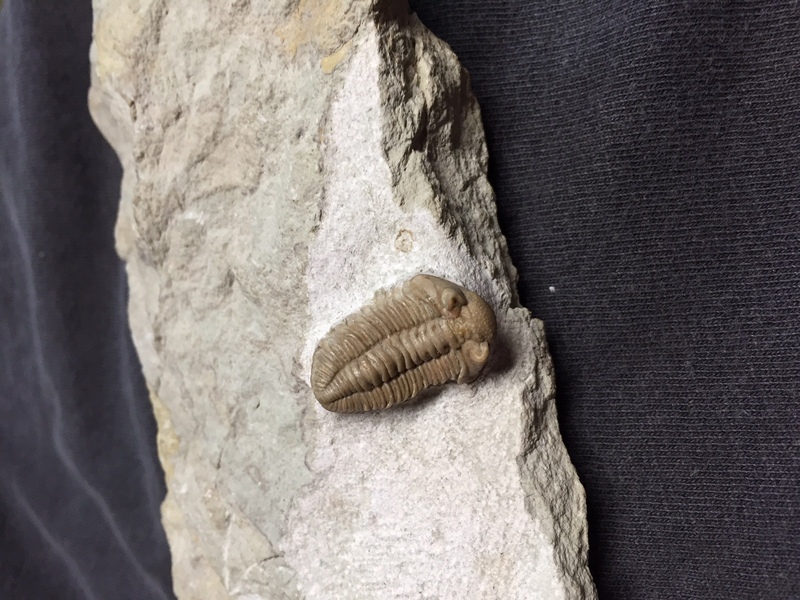 And he has passed along his love of fossils to the next generation, such as through his sons who are now well-known in the paleontology community. Don Good, for whom the award is named, was an avid fossil collector. He was a co-founder of the MAPS club four decades ago, setting the foundation for the MAPS Fossil Show that will be holding its 40th annual event in April 2018. Congratulations to Dan for receiving this well-deserved award! Figure 1. 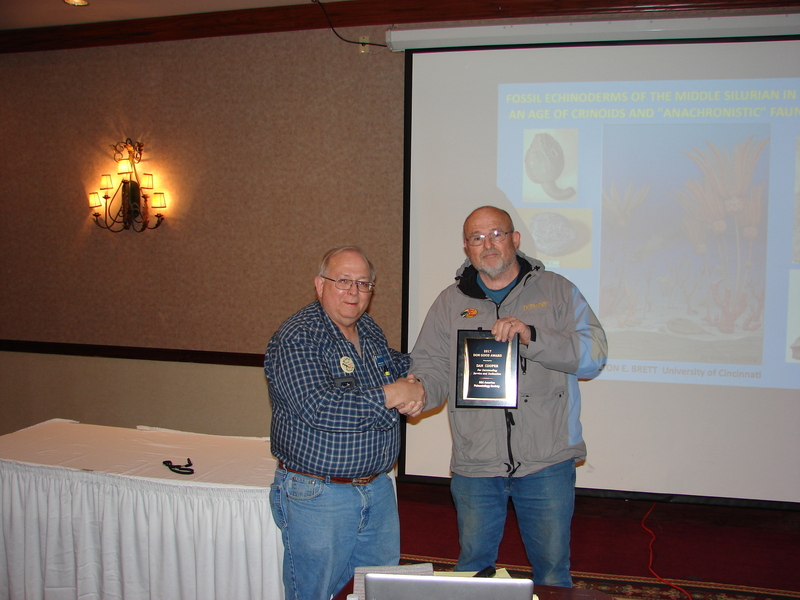 MAPS President Marvin Houg (left) presenting the Don Good Award to Dan Cooper (right) on March 31, 2017 in Iowa City, Iowa. Picture provided by MAPS member John Catalani. In addition to Carl and Dan, other Dry Dredger members who attended the show included Tom Bantel, Rich and Karen Fuchs, Mike Davis, Jack Heckscher, and me. Below are a few pictures (Figures 2-7) from the hotel show and the main show (pictures provided by Tom Bantel). Figure 2. 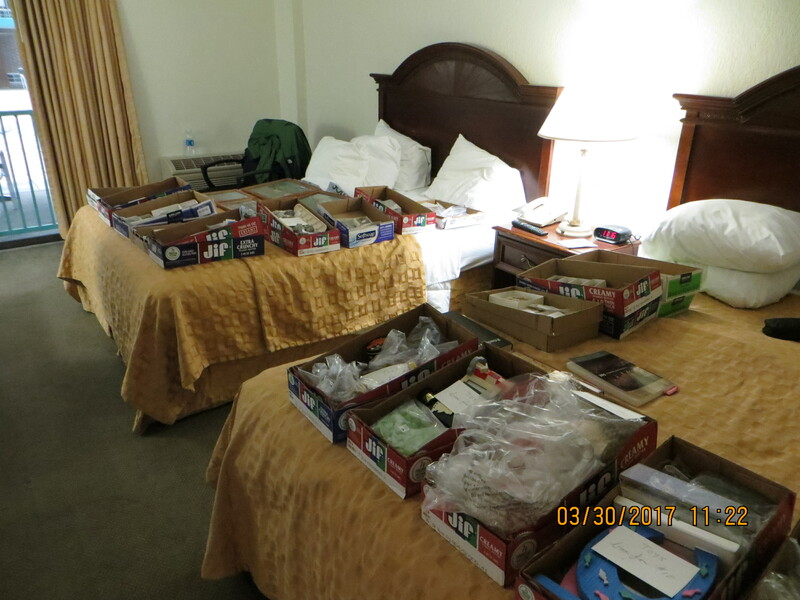 A typical arrangement of boxes of specimens on the beds in a room at the hotel. Some exhibitors also use the floor and top of the desk (not shown in this picture), and added tables for additional display. Fossil enthusiasts then meander into each room to view the specimens. Figure 3. An Arctinurus trilobite (Silurian, Rochester Shale) from New York shown at the hotel. Figure 4. 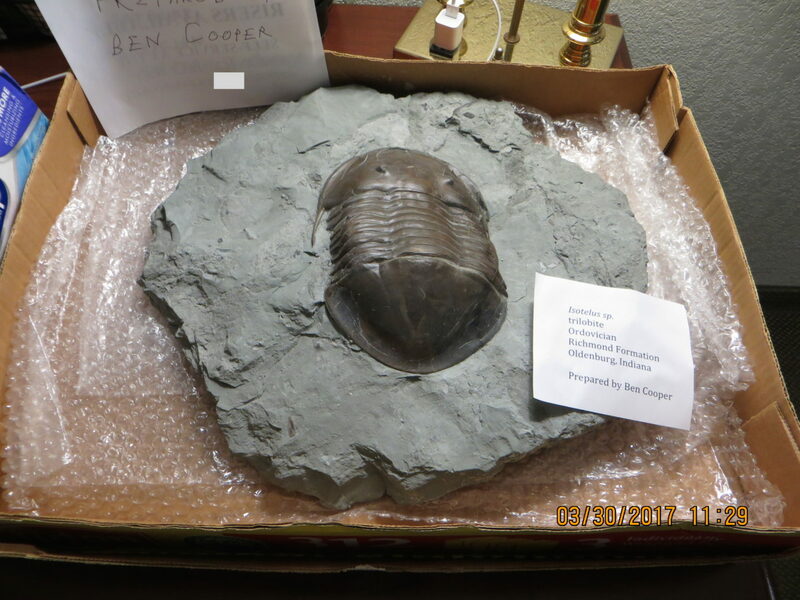 A giant Isotelus trilobite (Ordovician, Richmond formation, Oldenburg, IN) on display at the hotel. Figure 5. A scene of shoppers at the main show which is held at an auction house a few miles away from the hotel. Figure 6. 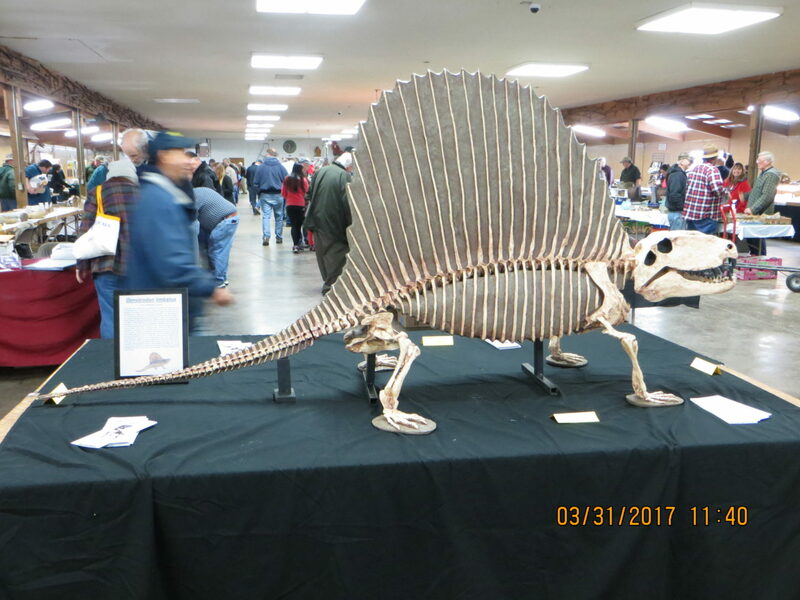 A Dimetrodon skeleton on display as an educational exhibit at the main show. Figure 7. One last “fossil” before our departure from Iowa City to return home. 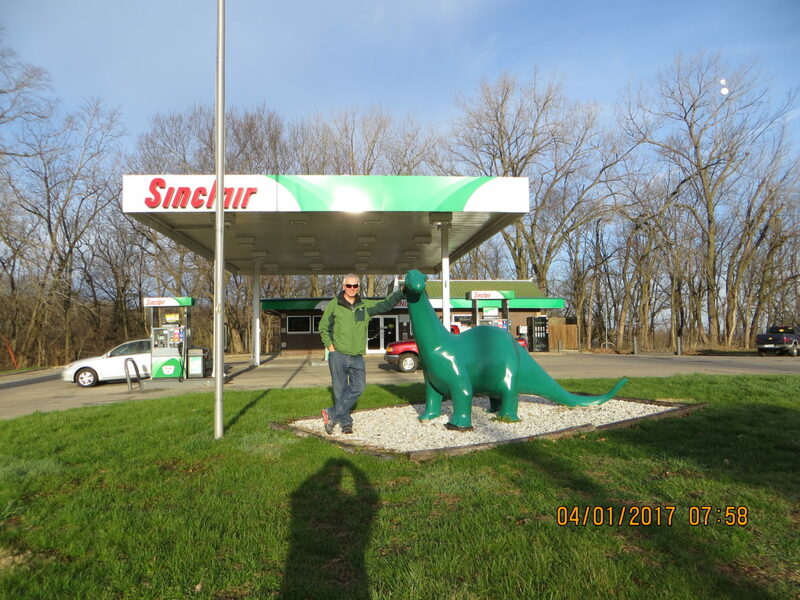 Pictured with the dino is Don Bissett. The shadow in the foreground is Tom Bantel taking the picture. And lastly, finally, IT’S ABOUT TIME, we get to some more pictures of fossils! Since in past blogs I have shared photographs of newly acquired specimens, below are some new additions to my hoard of rocks. 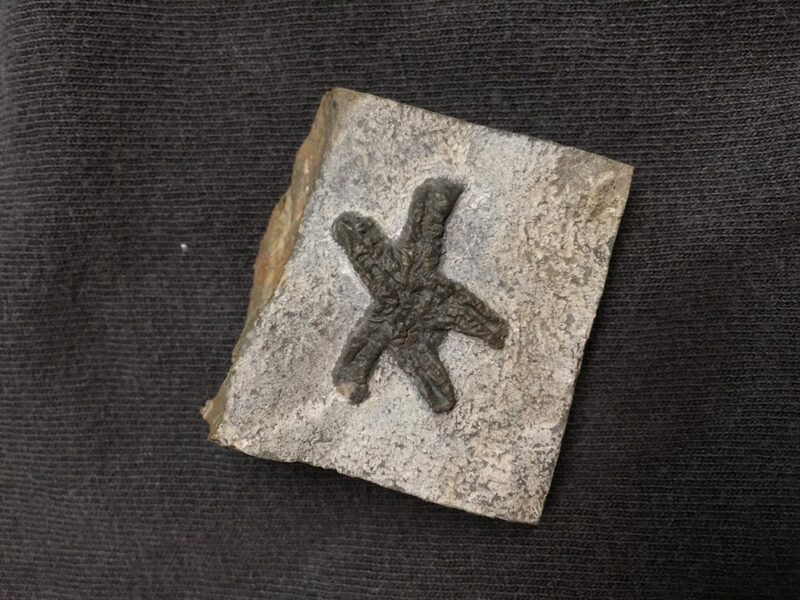 One is a nice double starfish from the chalk of Denmark (see Figure 8). Figure 8. Goniaster (Cretaceous, Denmark). Each star fish is 1 3/4 inches across. 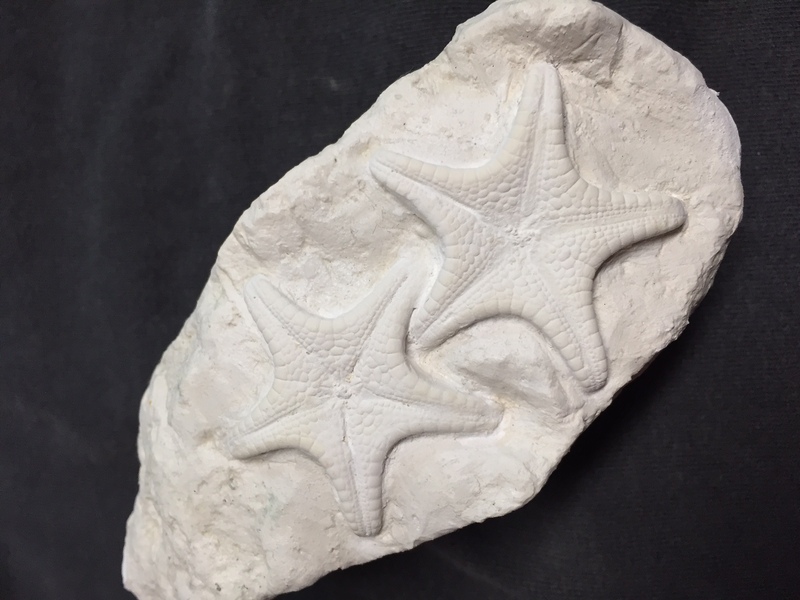 Another is a starfish from the Cincinnati area that was part of an old collection being sold (see Figure 9). 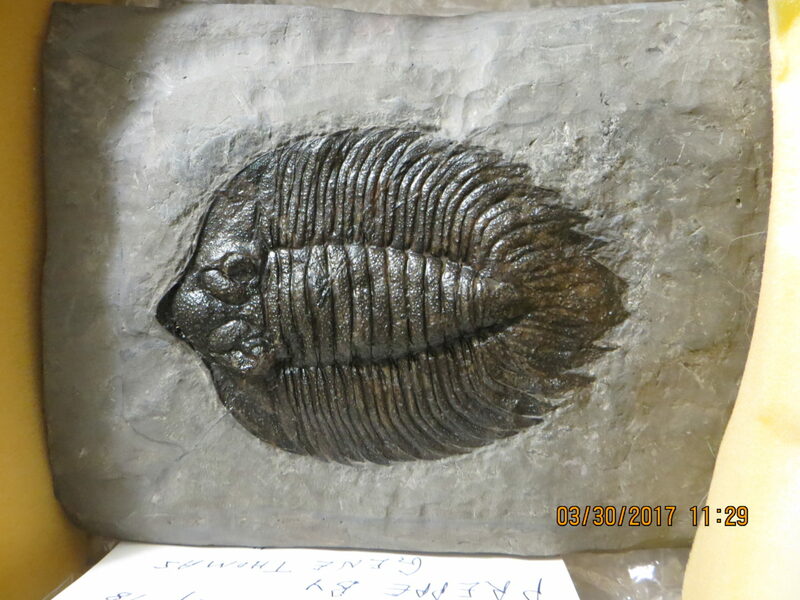 Yet another is a nice Russian trilobite that was part of an additional old collection for sale at the show (see Figure 10). Figure 10. Pterygometopus schlerops (Ordovician, St. Petersburg, Russia). Specimen is 1 1/8 inces long. 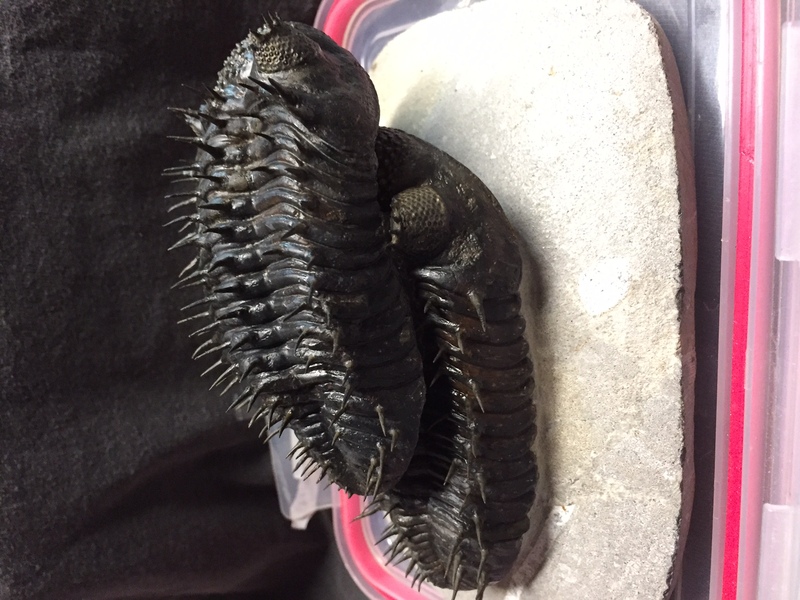 And then there is the biggee: a double spiny “porcupine” trilobite from Morocco (see Figure 11). Figure 11. Drotops armatus (Devonian, Morocco). 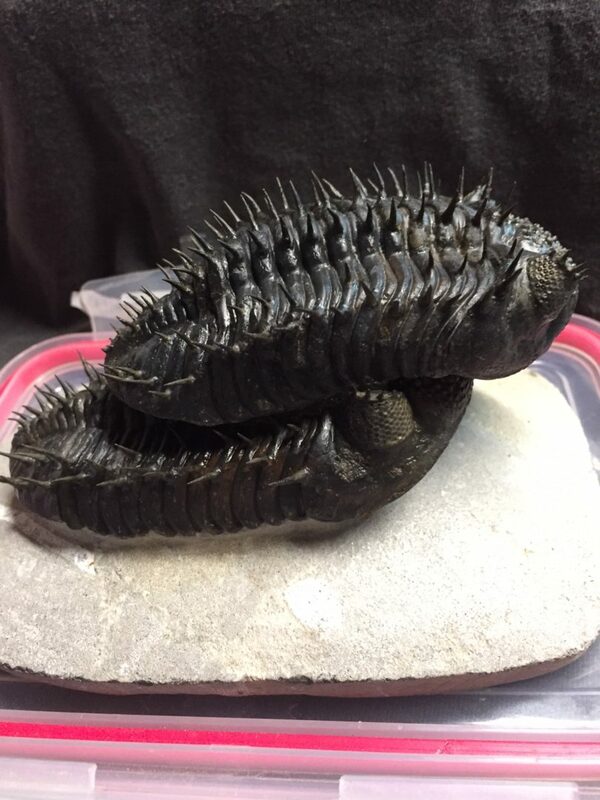 Top specimen is 4 inches long, bottom specimen is 4.5 inches long. So a good show. If you didn’t get a chance to attend this year, perhaps you will in 2018. Enjoy! 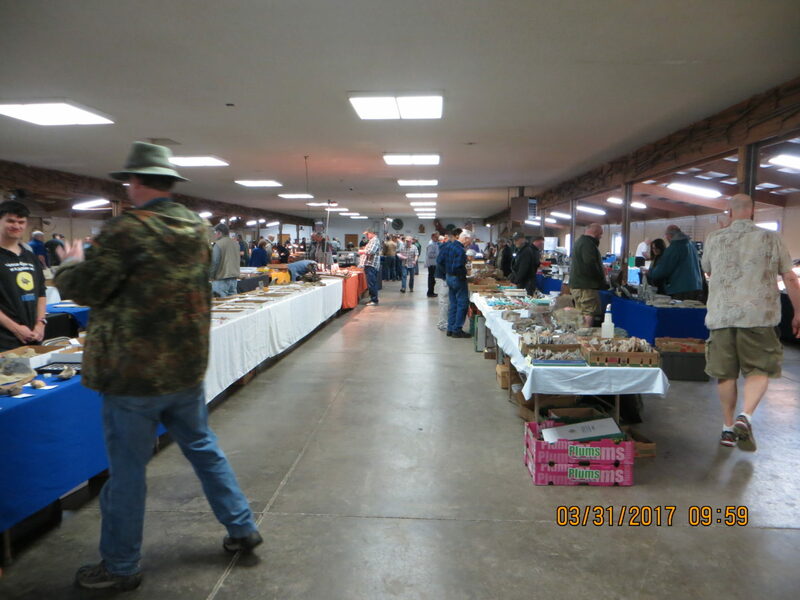 Tucson Show 2017: you brought home how many fossils?